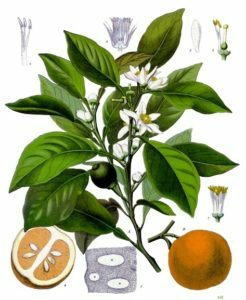 In the perfumery business, there are many copycat scents that are used to adulterate and dilute pure essences because their smells are so similar. Palmarosa is one of these impostor oils because it mimics the smell of rose. Records show that in ancient times, palmarosa was added to pure rose oil and shipped to the ports of the Red Sea, in an attempt to swindle the buyer who was spending vast sums of money for the precious rose oil. But, in all fairness, Palmarosa has its own place in the essential oil trade because of its therapeutic properties. Palmarosa is steam distilled from the fresh of dried grass of Cymbopogon martini. It is native to India and Pakistan but is now grown in Africa, Brazil and Indonesia. It has a light, sweet, floral scent, much like a mix between rose and geranium and is used these days in cosmetics, soaps and perfumes. Therapeutically it is wonderful for the skin and can be used as an antiseptic for acne, dermatitis and minor skin infections. It has the ability to help heal tissue and rejuvenate skin, therefore can be an excellent help with scar tissue and wrinkles. Massaged onto the face and neck, it is great for all skin treatments because it moisturizes the skin, regulates sebum production and stimulates skin regeneration. Palmarosa also is an effective aid for the digestive system. In A Guide to Aromatherapy, M. Maury states “This is an essence which acts on the pathogenic intestinal flora…this essence favors the transmutation of the pathogenic agent into normal cells of intestinal mucous membranes.” We can believe from this that palmarosa acts on intestinal infections and neutralizes the germs, creating a healthier intestinal tract. It is also known to stimulate digestion and can be of use with anorexia, encouraging hunger and regulating the digestive juices. For the nervous system, palmarosa has the ability to calm nervous exhaustion, therefore creating more energy for positive expression. Stress and tension melt away when this oil is burned in an aroma lamp. Because of its likeness to rose, it is considered a ‘feel-good’ oil, allowing a sense of well being and joy to permeate through, dissipating depression and moroseness. And because it is cheaper to produce, it is a much more affordable oil in comparison to rose oil!